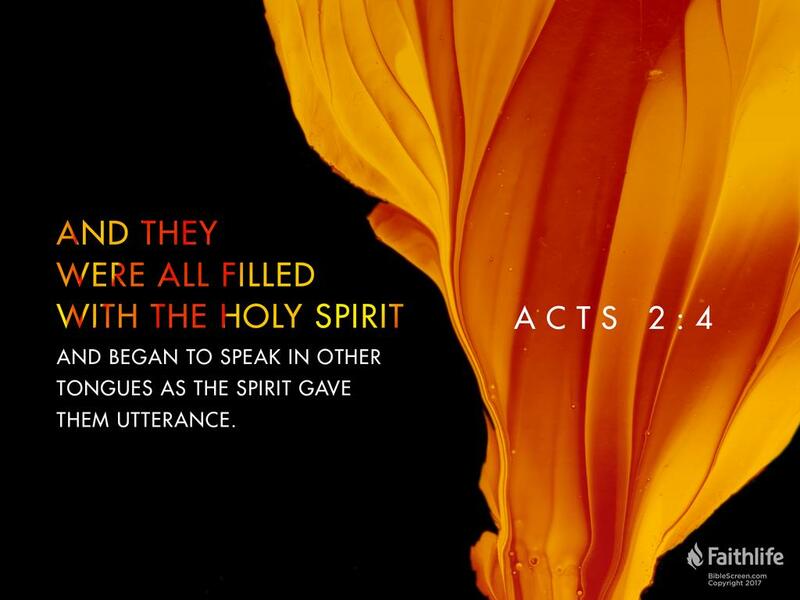 And when the day of Pentecost was fully come , they were all with one accord in one place. And suddenly there came a sound from heaven as of a rushing mighty wind, and it filled all the house where they were sitting. And there appeared unto them cloven tongues like as of fire, and it sat upon each of them. And they were all filled with the Holy Ghost, and began to speak with other tongues, as the Spirit gave them utterance. → The baptism of suffering experienced by Jesus. → The water baptism performed by John the Baptist. → Christian baptism in water. → Baptism of the Holy Spirit. The word "baptize" means to completely immerse or submerge in something. The true evidence of the baptism of the Holy Spirit was visible immediately in the life of the Apostle Peter. Before the Day of Pentecost he had fearfully denied that he knew Jesus. After his baptism in the Holy Spirit, Peter stood and gave a powerful witness to the Gospel that resulted in the salvation of 3,000 people. It was the power of the Holy Spirit in the early church that resulted in the spread of the Gospel throughout the world. 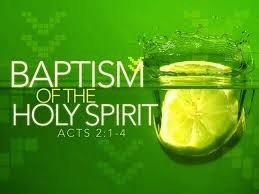 The book of Acts is a record of this powerful witness which was evidence of baptism in the Holy Spirit. baptism is an outward confirmation of an inward spiritual experience. → A national promise: "Unto you" [the Jewish people]. → A family promise: "Your children". → A universal promise: "To all that are afar off". If you have not received the baptism of the Holy Spirit, what are you waiting on? It is the Holy Spirit that enables you and gives you the power to live a life pleasing to God. The men in this passage were Jews and it was a requirement for all Jews to partake in this ritual and what was part of this ritual John's baptism of repentance it included being immersed in water and this is the baptism Jesus was part of. This is also the baptism the disciples did with Jesus walking the earth and they perfumed this ritual together with John in the same river. Today's water baptism is not in scripture when Peter baptized Cornelius this was John's baptism and this consisted of confessing all your sins. Today's baptism is something man has made to his own liking. The apostle Paul never received a water baptism but received the baptism of the Holy Spirit and this is what was promised to the Jews and when Paul believed and after Ananias laid hands on him Paul rose and was baptized. The baptism of the Holy Spirit is Jesus putting a seal on us because we believe. Today's baptism is something we should think hard about. See Jesus Himself has baptized us and this is through faith but we as Christians go running to the water thinking we have to do something for His grace. Paul only baptized a handful of people but they were Jews partaking in the ritual of John's baptism. Baptism of suffering by Jesus - Luke 12:50, Matthew 20:20-23, Mark 8:31, 9:12, 10:38-40 - this one is usually not spoken of in terms of baptism, but since this is what Jesus called it, it was mentioned in the intro of my post. 3. You shall receive the gift of the Holy Spirit. This instruction was given to all in hearing distance and again no distinctness to a particular set of people. If you believe in everything the word of God tells us, then you have to believe water baptism is a necessary step in God's plan of salvation for us. Water baptism is an outward expression of our inward repentance and symbolizes a washing or cleansing of our sins and being covered by the blood. Not to lose focus on the post; it is speaking of the necessity of having the comforter, the power from on high, the gift of the Holy Spirit which was promised to us! Actually it wasn't Paul it was Peter and Peter was talking to Jews in the Temple it was only Jews that were allowed in the Temple the Jews could not associate with Gentiles. During Peter's ministries the message was only going to the Jews so baptism was required for the Jews. Peter was eventually pushed by Jesus to go to the Gentiles but it was not liked by the Jewish council. There is no steps when it comes to faith and when the apostles stepped out into Samaria they were not given the Holy Spirit when they were baptized. Laying of hands is what is done. In Acts 2:37 the Jews ask "What should we do". Today Paul teaches its about faith and faith only we are not Jews we are Christians and it is not about doing rituals but its about faith and showing other through are works and are works shows are character that everyone will see that the Holy Spirit dwells in us. Inward repentance comes from are Father's love its are Father's love that brings us to repentance -- not water. Which is greater are Lord's blood or water. This is what I was trying to say in my first post. We have to think hard about water baptism because Jesus has already purified us with his blood and this is through faith. Its almost like telling God you don't believe He has cleansed us, tell I jump in the water. Water is a symbolism for the Holy Spirit but today the Holy Spirit is preforming this. It is no longer about doing things for God's grace its only about believing. Doing things was part of the Jewish make up they were given blessings if they obeyed. Christians under grace are given everything if we believe right up front. Jesus talking to a Jewish man, but here in this verse Jesus is talking about being born again, we have to become a new creation in Christ this is why repentance is so important we need to remove us from are old self and the Holy Spirits dwells in us making us this new creation. The verse connected to your statement about Paul which should be Peter. Peter is still preaching Kingdom that Jesus will return after all the Jews repent and be baptized. Peter only sent his message to Jews and only Jews. Paul then brings the good news to the Gentiles but Paul brings us the mystery that we are Children of God or son's of God and that we will inherit the Kingdom of Heaven, the Jews are looking for Jesus to come to earth and setup His Kingdom and this is the reason they are doing what is required. Paul brings we are justified through faith and never pushes baptism of water but baptism of the Holy Spirit. Paul will also tell the Corinthians that he did not come to baptize but to preach. Remember Paul was not baptized with water but the Holy Spirit. I think Paul was thinking the same thing. The Holy Spirit already baptized me what can water do for what the Holy Spirit has done. Romans 6 is a great chapter talking about *Dead to Sin Alive in Christ. No place dose Paul say we need to run to the river to be saved. This is what is happening in the world and when we look at scripture we need to understand who is talking to whom; also not use blender theology and put verse out of context. Today we shouldn't do things for God's grace because He has done everything for us all we need is to believe. Second, we clearly have differing views on how we interpret the word of God. I have been baptized in the name of Jesus as Jesus himself instructed the disciples to do in Matthew 28:19. If you think this is in error, that's ok. I'd rather err on the side of safety. Third, I don't feel that I am taking scripture out of context but rather connecting the dots. There is no contradiction in what Jesus instructed the disciples to do, and what Peter began on the day of Pentecost and what Paul taught. As far as faith goes; exercising it rather than intellect will further our understanding of God much better than the mind can ever hope to perceive. When Peter understood who Jesus was, that revelation came from God; not from Peter's intellect. (That was just a side thought on your mention of faith).